Communicating and promoting youth engagement successes can bring support from the broader community, current and future youth leaders, partner organizations, and foundations. More importantly, celebrated successes help validate youth work and encourage others to recognize the value of youth engagement. Oftentimes, great youth work goes unnoticed until assertive allies and youth take the communications initiative. Adult allies and health center staff should consider the following platforms for sharing youth engagement efforts, while youth should be empowered to promote the school and/or community health work to broader audiences. 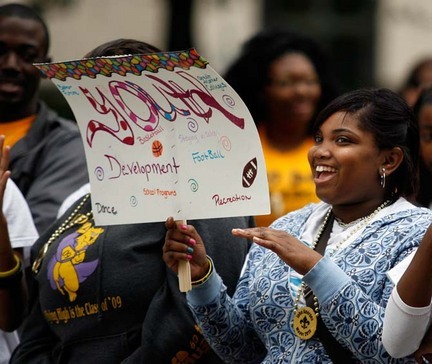 Youth engagement should become a part of the health center’s standard communications work. Online updates and email communications should include news about the progress of the youth program. Analog communications, such as newsletters, mid-year and year-end letters, campus newspapers and publications, and handouts should also mention the youth work at the site. Youth can support this by developing communications pieces. Adult allies should ask for written and creative updates from the youth team and include them in health center communications. Including this work as part of youth engagement program can also build skills for youth who participate. Social networking sites, like Facebook, Twitter, and Instagram, are useful platforms for sharing brief messages, photos, videos, and related media. Young people and adults should use these interfaces to draw attention to upcoming events and past successes. Another way to publicize youth accomplishments is through the media. Many of the things the youth program does each year are likely “newsworthy.” Reach out to the media about an open house, community meeting, or the launch of a new initiative. Consider the audience. Are communications directed towards young people? School health professionals? Community stakeholders? Legislators? Even with a varied audience, how can the message and successes be clearly articulated to all? Uplift youth-generated communications and promotion. Are youth interested in sharing their achievements with others? Are they well equipped to produce communications pieces? What resources do they need? Garner media coverage. When you have a newsworthy story, start looking at the media outlets in the area. Youth can look at where community members get the news. Maybe it is a local paper, a larger regional paper, or the local television station. Don’t forget online blogs. Note the journalists that cover health, youth, or education in order to contact them directly.